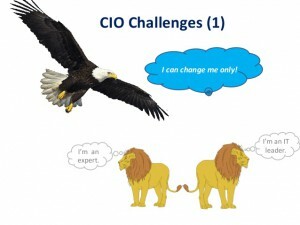 In the following months, I will be blogging on typical CIO challenges and describe potential ways to approach the challenges, exemplified with the story of a fictitious person. The story begins when he assumes the post of CIO in a typical medium sized company. Peter Sommer joins Olfama Company as CIO. During the interviews, he learns that management is not pleased with the performance of the IT organization. All change projects involving IT are running late and have overshot the budget. Many of the critical IT-systems are old-fashioned and parts of their functionality are already outdated. Most of the systems were originally bought as standard systems, but almost all of them have been modified and adapted heavily during the last two decades. The IT‑budget has had a history of constant increase until it was cut significantly last year. This led to lower quality of IT‑services, particularly, service desk response time and system availability. Peter decides that the fastest way to get an assessment of the IT‑function is to hire a consultant to do a COBIT maturity assessment of the organization. He will participate in most of the interviews to bond with the interviewed, from top management to key IT‑employees. Peter manages to get all of top management to participate in a short workshop to prioritize Olfama’s business goals; and gets them all for 30 minutes! Knowing that it is probably not enough, he accepts anyway. After 15 minutes and heavy discussions, the CEO said that they had better give this an hour more – it seems, we have been missing this kind of facilitated discussions on our corporate goals. When they finish the workshop, they have a list of prioritized business goals – a vital input to prioritization of the project portfolio, from which a list of prioritized IT‑goals can be derived. This will increase the alignment of business and IT and Peter, now, knows what he will be asked to achieve that is tightly linked to business goals and top management priorities. From the interviews with his IT-managers, he not only learned that they have a pretty good sense of what’s important to top management with only a few concerns missing, but also realized that they had no clue about the prioritized sequence of concerns. Peter is now looking forward to the upcoming assessment of the IT‑function’s maturity, related to the high priority COBIT processes that also came out of the workshop with top management. Only this way, he will know what is of importance and where the gaps are – a good starting point for improvements. 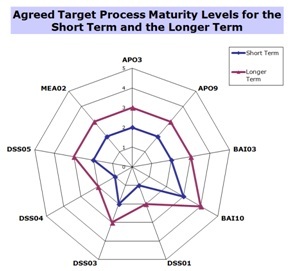 In my next blog post, I will reveal the results of the maturity assessment and show how these results can lead to the insights into possible causes for the issues facing the IT‑function at Olfama.